Sedation dentistry is perfect for those who experience an overwhelming sense of panic and anxiety when going to the dentist. In addition, many people simply would rather “not be there” while we do their dental treatment. Any type of procedure you need can be done under sedation in a relaxing and comfortable manner. You’ll have very little memory of your appointment and wake up refreshed and feeling good. Sedation dentistry is a type of procedure that involves providing medicine to help patients feel at-ease during their dental appointments. Dr. Rutherford uses oral conscious sedation at The Art of Dentistry, which is a moderate form of sedation that involves taking a pill that is prescribed to them. This helps patients feel extremely relaxed as Dr. Rutherford performs their restorative or cosmetic dentistry procedure. Some individuals even fall asleep during their procedure. For oral conscious sedation dentistry, you will be given a pill to take the night before the procedure. By the time you arrive for the appointment, you will be drowsy and in a very relaxed state of mind. During the procedure, no IV needles will be needed and your vital signs will be monitored. Most patients tend to sleep during the treatment, though they can respond to given questions or requests. When the treatment is complete, you will go home and “sleep it off” and have little or no memory of the appointment. Call us for a free brochure and audio CD explaining more about oral conscious sedation. Sedation dentistry allows for faster treatment because in most cases all your needs can be taken care of in as little as one visit. This is far better than having to take off work many, many times to have only 1 or 2 things done at each visit. This solves both the fear and the time problems for most people. Ultimately, sedation dentistry places patients into an extremely relaxed state that calms both the body and mind. Although patients can freely communicate with the dentist during their procedure, many people drift off during treatment and do not remember the details of their experience. With oral conscious sedation, patients can put their fears of the dentist behind them, take care of their oral health, and maintain a beautiful smile. Many candidates for sedation dentistry have complicated dental issues at advanced stages due to avoiding necessary dental work. When fear of the dentist prevents you from receiving the care you need, more complex and costly oral health problems are likely to develop. Conversely, sedation dentistry allows patients with dental anxiety to receive prompt treatment and maintain good oral health. 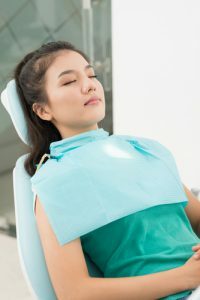 Sedation dentistry can also be useful for patients who wish to address a larger number of cosmetic concerns with a smile makeover, as oftentimes the dentist can complete more dental work in a single office visit. This depends on what you’re having done that day. You’ll be sedated for as long as it takes us to complete everything we’ve planned to do for you. Usually it takes between two and six hours. How Does Sedation Dentistry Differ from General Anesthesia? Unlike a hospital operation under general anesthesia with its risks, sedation dentistry allows you to remain awake but in a deep state of relaxation. With oral conscious sedation, patients can speak to the dentist and respond. However, many patients will be so relaxed that they will doze off. This makes it possible to experience your dental procedure with no pain and little or no memory of the appointment. Sedation dentistry is used under the supervision of our experienced cosmetic dentist. Dr. Rutherford has extensive training in sedation dentistry techniques to give our patients peace of mind that they are in good hands. During the consultation process, Dr. Rutherford will review your medical history, discuss your concerns and expectations, and make sure sedation dentistry is the best choice for you. If you are a good candidate for sedation dentistry, your vital signs will be carefully monitored by a skilled associate during your procedure to ensure your safety. Are There Any Side Effects Associated with Sedation Dentistry? Oral conscious sedation typically has minimal side effects, all of which should quickly fade as the medication wears off. After taking the pill, you will begin to feel drowsy. During your treatment, you will be so relaxed that you may not even remember your appointment. As the pill’s effect gradually subsides, you may experience temporary side effects such as dry mouth, dizziness, and nausea, though this is not always the case. Will Someone Need to Accompany Me if I Get Sedation Dentistry? Yes, due to the sedative effects of the medication, you will need someone to drive you to and from the office, and stay with you for the remainder of that evening. The following day, however, you should be completely back to normal and can resume your everyday activities. The cost of sedation dentistry will vary based on the dentist, the practice’s geographic location, the type of sedation being provided, and the patient’s insurance coverage. On average, oral conscious sedation tends to begin at $225. Our staff will provide you with a personalized cost quote prior to your procedure to help you plan for your total cost. Although sedation dentistry is an additional fee to the planned dental treatment, patients usually find this cost to be more than worth the peace of mind it offers them as they receive the dental care they need. To learn more about oral conscious sedation and find out if it is right for you, contact Dr. Rutherford – The Gentle Dental Doc or click here to visit the website of the Dental Organization for Conscious Sedation (DOCS), which trains dentists nationwide and internationally to provide this for their patients. Due to his extensive education and experience in sedation, Dr. Rutherford was recently honored by being granted Fellowship in the Dental Organization for Conscious Sedation, a distinction achieved by fewer than 2% of its member dentists.